HÀ NỘI — Party General Secretary and President Nguyễn Phú Trọng asked the central province of Nghệ An to address obstacles to becoming one of the leading localities in Việt Nam during a meeting between the Politburo and local officials in Hà Nội on Thursday. 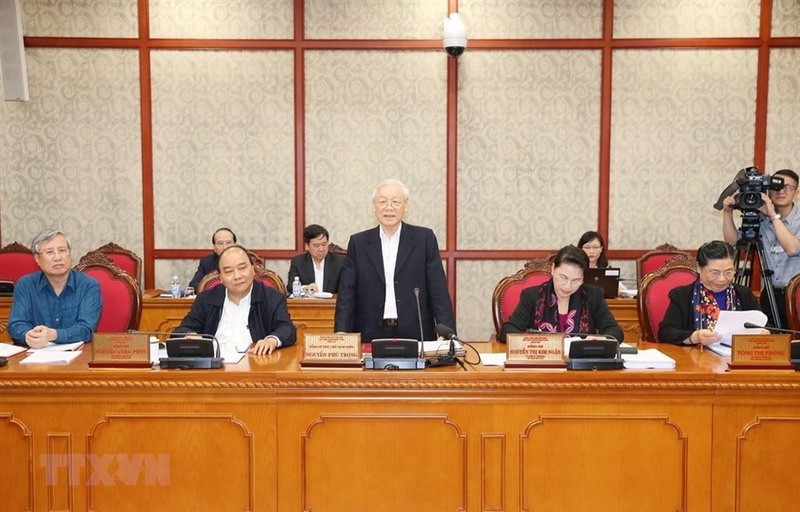 The meeting reviewed the implementation of the 11th-tenure Politburo’s Resolution No 26-NQ/TW on development orientations and tasks for Nghệ An until 2020. Delivering a report at the event, Secretary of the provincial Party Committee Nguyễn Đắc Vinh said the resolution, issued on July 30, 2013, shows the Politburo’s focus on Nghệ An and its commitment to creating development opportunities and momentum for the province to realise its potential. The local economy has grown quickly and sustainably since then, Vinh said, noting that the gross regional domestic product (GRDP) was estimated at VNĐ115.67 trillion (nearly US$5 billion) in 2018, ranking 10th among the 63 provinces and centrally run cities. The household poverty rate was reduced to 5.54 per cent. Meanwhile, 218 of the province’s communes, around 50 per cent, had been recognised as new-style rural areas by the end of last year. Party building and the consolidation of the political system have been enhanced and had a positive impact. The political system has been re-organised towards a lean, efficient and effective apparatus. Activities of local Vietnam Fatherland Front committees and socio-political organisations have also been improved. However, Vinh admitted, it is hard for Nghệ An to achieve its targets for economic growth, per capita GRDP and budget revenue. Infrastructure, especially in the western areas, has yet to meet development demand, while some social issues have not been resolved in a timely manner. He also pointed out certain problems in Party building, political system consolidation and the performance of some local governments. Highlighting some major targets in the implementation of the resolution, the official said his province will work harder to develop quickly and sustainably so as to deserve its position as an integration and development driver of the north-central region. Addressing the meeting, Party General Secretary and President Trọng said that in the last five years, Nghệ An has made efforts to move forward and has made considerable achievements in economy, culture, society and defence-security. He also recognised the strides taken in Party building, political system enhancement and building new-style rural areas. He attributed the failure to reach some of the targets set in the resolution partly to a lack of determination and breakthroughs in leadership, as well as shortcomings in institutions, infrastructure and human resources.